Hey Don, How is this project working out? I am designing a 6x12 one in similar fashion and would appreciate hearing your tales of woe or successes. Sorry about the delay answering, but this project has been on hold while I have been partially rebuilding the 2x16 in-line ZP described elsewhere in this section. That said, I have been thinking about the 4x8 design. The stud-track frame is at a point where I will probably stick with a single-plane design with a U-turn at the end, and save the ZPDP idea for a future build. I think it's easier to stack two stud-track sections before the back is glued in, and I would need more depth for a ZPDP. Tentative plan is to make the screen assembly full-size (48 x 96, less whatever is taken up by the frame, insulation, etc.) with a divider strip down the middle. The divider would start at the end where the in/out ducts are located, and end at the beginning of the turnaround section. 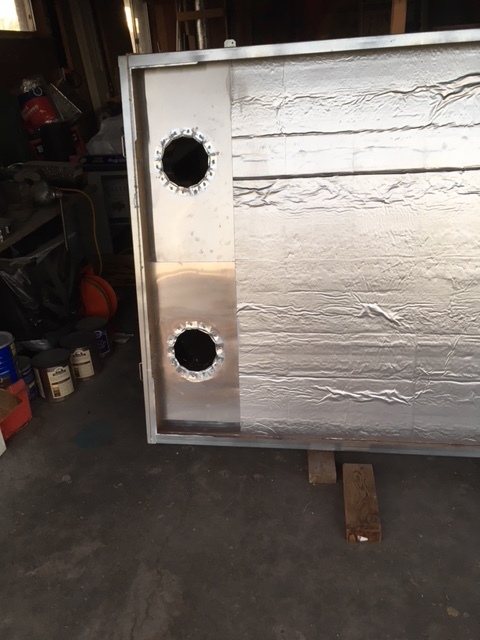 The screened part would start just inboard of the duct openings and go all the way to the far end. 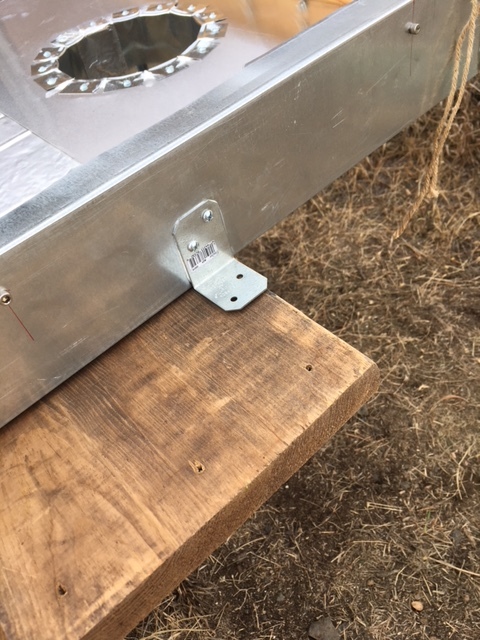 Spacers between the 2 screen frames around the perimeter could be small wood blocks, screws running through metal tube spacers, wood strips, or even strips of polyiso. Still have a lot of details to work out, but one goal is to minimize the 'overhead' taken up by the center divider between the lower and upper channels, to maximize screen collection area. Also need to prevent short-circuit air flow paths between the down and back channels. I'm also considering options for how (or whether) to include some curved pieces around the outside of the turn-around section; it's probably easier to get the screen tight with a square frame, although it may be possible to fit some curved pieces into the sandwich afterward. At this point, I may go back to wood screen frames and stapled-on black aluminum screen. Pianoman Jim pointed me to a screen supplier, wholesalescreenandglass.com, which has black screen (not charcoal, although they have that too). I have had trouble in the past spray-painting screen outside - seems like no matter how calm the wind is, it always starts to puff a little whenever I pick up a can of paint. Last time I ended up with too much loose 'paint dust' on the screen. Also planning to paint the frames and the rest of the interior with can and brush for the same reason. It's just easier to control when you're working outside. I will post updates as they come up. It is winter after all, but we always get some warm spells. No need to apologize for your "delay" which I understand. It has been a record cold for a long time here in PA, too. I have been following your other project, too, and have learned a lot from both of these...thanks for sharing your ideas. 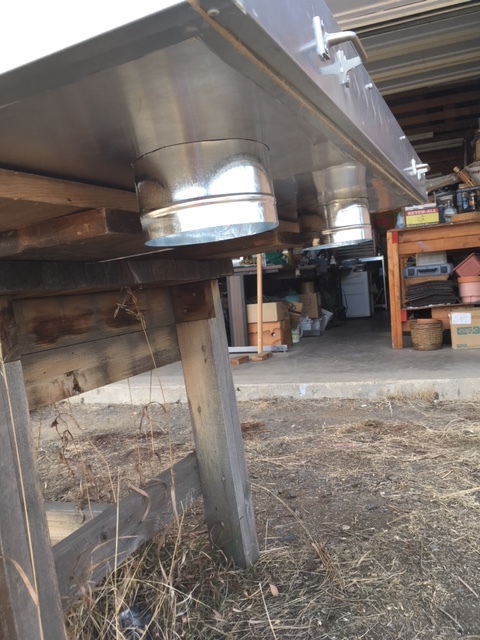 I like the new gaskets and may try something like that for my 8x8 water preheater that I had to reset the glazing on this fall after two years of expanding and retracting. It was too cold to spend much time, and I just peeled off the aluminum framing holding the twin wall from the bed of silicon caulk and was surprised to see how intact it was. It resealed, but I don't know for how long. I may try your method with this project. 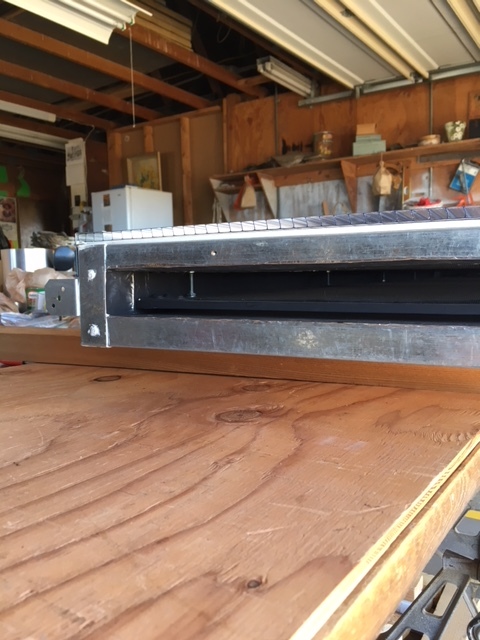 I am may build the screen frames from some 20 year old oak trim pieces removed from another project and staple the screen with my pneumatic staple gun...quick and easylike. I used the Screen Tite System to rescreen my porch a few years ago and have been very pleased with it. I haven't costed that out, but might use two layers for the back double screens, if it doesn't break the budget. Thanks for the screen source website...black screen seems like a great idea. I am thinking now about having three 4x6 foot screens across the collector to keep the build simple and tight. I am planning to have a 1 1/4 gap, but may eliminate one layer of back screen to make it wider in the future experiment, so I am assembling with the intention to easily disassemble it. In thinking about plywood for a screen frame, I would be afraid that the heat would compromise the glue in the plywood and cause some splintering. I have had something similar to that happen with some T111 siding that used to trim out a south facing window sill at my hunting camp. Thanks again for sharing your thoughts. I hope I have the ability to do such fine work. Stay warm! I like your idea to use seasoned oak trim for the screen frames; it's surely a lot straighter and stronger than the common pine or fir boards available at HD, etc. New oak, or even poplar, is really expensive; you have a valuable resource there. Your proposed 1 1/4 inch screen gap sounds good. Greg Wilson and Krautman Craig ran some screen gap experiments last year. I forget which section they are posted in, but there is a lot of really interesting and valuable information there. I remember they tested different gaps side by side an found that a 1 3/8 inch gap yielded the most heat. I am wrestling with that same subject in my new design, since depth is limited with the frame I am using (3 5/8 inch metal stud track). Not sure I follow you on the back screen - you can have a double screen layer that wouldn't appreciably add to the depth, just one screen right on top of the other attached to the same frame. I think the shared experience of others here is that doubling up the rear screen is beneficial, as more solar radiation is captured by the screen absorber instead of going through to the back surface. Agree with you also on mounting your collector out from the wall a bit. I too have a brick wall with wide overhangs. Stand-off mounting gives you a little space to run outside ducts out the back of the collector and over to the window. Fortunately, it looks like your duct runs will be short, which ever design you go with (1 way or U-turn). I read your posts in the Hot Air section too. Looking forward to seeing how your project goes. After me and Craig ran our screen gap tests(In the Experimentation and Performance Forum), I wanted to see if I could retrofit my original ZP from a 1" screen gap to the more efficient 1⅜" screen gap. But like you, I used the steel stud tracks. While I did make my screen frames out of wood, I could gain the needed gap between the screens if I switched to thinner metal screen frames. The problem I had is with the 1" gap between the two 8' sections. There isn't enough room to enlarge the gap between the sections and still have structural integrity. If it was a permanently mounted collector it wouldn't be a problem. But with seasonal moves, it isn't practical. So I'll have to wait to make any improvements on my "next" ZP version. Greg, I considered making new wood screen frames for the 2x16 when I had it apart. I widened the ends slots (on your advice, if I remember) before I put the frame together. My slots are 1 3/4 inch wide, but I don't know if even that would let me increase the screen the gap much. Part of it is where I removed the additional material. The back edge of the slot is flush with the polyiso back sheet, so the whole back screen is visible in the gap. Probably no harm in that. 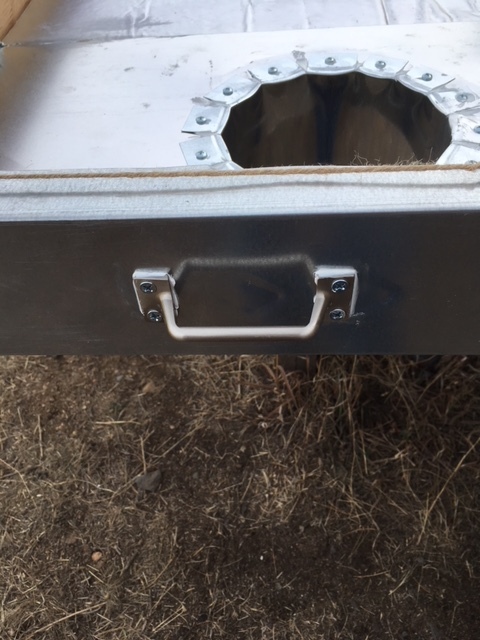 The frame in front of the slot is about 7/8 inch wide. I didn't want to take much more out because the frame was none too strong there, even after I put in 3/8 inch plywood backing (the plywood didn't feel too strong either. The front screen surface is nearly flush with the edge of the slot; I could only get the screen gap out to 1 3/16 or so, without the front bit of it being blocked by the frame (I was shooting for 1 1/4 at the time). I could still move the front screen forward, but then I would need to re-design the J-channel cross-baffles that run across the end of the screen frames. This is another reason I'm not too enamored with the window screen material. I still like the 2x16 collector size (the sections are really easy to handle), but if I do it again, I want to somehow make it so it goes together as one integrated frame. I liked how Solar Dan's 2x16 frame came out. If I ever mention making another 2-piece collector with slots, somebody please slap me. For my new 4x8, I'm really looking for some alternative to either generic window screen frames (disappointed in how those turned out) or 1x2 wood (too thick). Main thing I would like to do is make the back frame thinner. The front frame could still be 1x2 - that would keep the screen 3/4 inch back from the glazing, while providing a flat surface for the glazing to rest on. Fitst, I drilled holes around the frame, 24 in all, through the track and the plywood behind it where the hardware will go to hold the glazing on. I back-drilled the plywood for T-nuts and tapped the nuts into the plywood. I also installed handles on each end, and 2 angle brackets on the top for attaching the collector to the wall-mount. These parts were bolted through, with nuts on the inside. 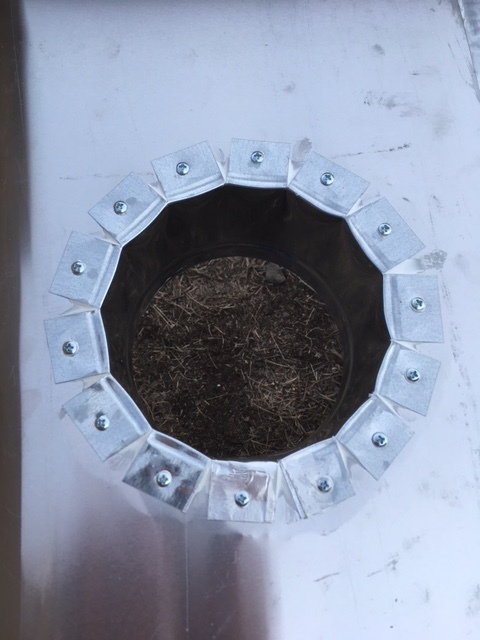 On the angle brackets, I added backing plates on the inside for additional strength. All these methods and materials are similar to what I used on the 2x16 ZP. Not thrilled with any of it really, but it worked OK last time, and I couldn't think of anything better, at least with materials I could buy locally. 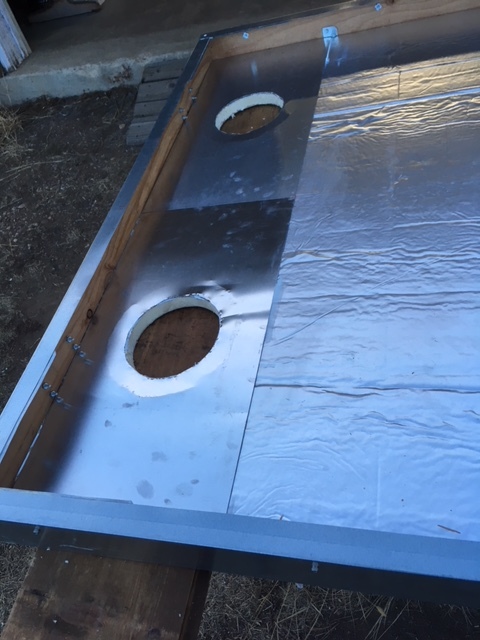 I thought about taping over the edges of the inside aluminum sheets, but I held off because all the edges will eventually be covered. Next step is to add polyiso strips around the inside of the track frame. The long exposed edge of the sheets will be held down by the lower screen frame, and the center joint will be covered by a central dividing wall separating the input and output plenums. Still thinking about how to do all that (except the polyiso strips). To get the ZP screen gap out to 1 3/8 inch (goal), the two screen frames can only take up 1 1/4 inch between them. I figure to make the front screen frame out of 1x2's, so I need to get the back frame down to 1/2 inch. Trying to 'blue sky' Greg's chicken wire-backed screen idea too. Anyway, winter's coming back tonight, so I have a few days to think about it. You're moving right along there, Don! You do nice neat work. I like the handles! Are you going to have screen in the back of the plentium (around the 6 inch holes) or on top (under the glazing) and are you planning to have glazing the whole length, including the plentium and the turn area? Have you decided on the fan yet? With a turnaround you may want one that can handle high air pressure. Looking forward to see how it works. Bruce, I am planning to cover the whole front with glazing, with the plenums painted black inside like everything else. At this point, I am leaning toward no screens in the in/out plenums (they will only be about 9 inches wide), although I could put a layer of screen under the glazing, at the same height as the rest of the front screen. Haven't decided for sure yet. In the turnaround area at the far end, I want to have front and back screens continuous with the straight sections. I'm still working this part out, but I'm trying to make the entire screen absorber as one unit, with a divider that ends at the turnaround. Planning to make the channel the same width in the turnaround as in the straight sections (approx. 22 inches wide). The turnaround area will be glazed like the rest. Bert, I'm hoping to use the same Suncourt TF-106 centrifugal fan (410 CFM rated, 'very free' air) that I'm using now with the 2x16 ZP. Part of the experiment is to see how well it works with the new design, which will have much shorter outside ducts. I suspect the ZP design works best with a straight shot, but with the turnaround section, the air flow cross-section and overall length will be similar to the 2x16. Both designs are probably not ideal; one has a u-turn, the other has a joint in the middle. Another serious compromise was how I ran the ducts up and over the brick wall. Besides being a pain, I don't know if I have room to do it a second time. For the moment, it's one collector or the other. I'd really like to run both units together, so I'm looking at replacing the fixed ducts inside the chase with a larger rectangular duct. Maybe then I can upgrade to an 8 inch fan which might move enough air to run both collectors. Also thinking I'd really like to try a straight 2x16 made as a single piece, sort of like what Solar Dan did a couple years ago.